Do you know what the Kennebunk Plains, Scarborough Marsh, Brownfield Bog, Weskeag Marsh, Caribou Bog, and Messalonskee Lake have in common? They are top Maine birding destinations, and they are all part of the Maine Department of Inland Fisheries and Wildlife's 100,000- acre + network of Wildlife Management Areas. Maine Birder Band: Show your support for conserving Maine's bird life and habitat. Everyday, your Wildlife Department is working hard to protect Maine's birds, bird habitat, and access for birders. Maine's hunters and anglers through license fees and equipment taxes have paid for the bulk of these efforts. With declining funds available for non-game and endangered species work, our bird conservation efforts now also depend on Maine's birding community to help conserve what you care about. For years bird bands have helped biologists understand migratory bird population trends and habitat needs. Now the Maine Birder Band is available as a tool for wildlife watchers of all stripes to support the non-game and endangered species conservation efforts of your Wildlife Department. The Maine Birder Band can be proudly worn on your binocular strap to show your support for bird conservation. 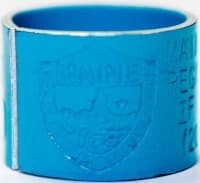 The number on each band will be registered to the buyer, and bands include a phone number where lost and recovered optics can be reported allowing us to notify the registered owner. Your $20 annual contribution supports Maine birds, bird habitat, and birding access and earns you a Maine Birders Band. Visit our online store to order your Maine Birder Band today! The birds you enjoy viewing thank you!